The security kiosk at the entrance to Century Village, a gated community that is now home to a public polling station. "To even get in to the gate you needed to show an ID, before you even got to the polling place itself," Polizzi says. After voicing her concerns that the complex was being used as a public polling station, private security workers told her "too bad," she added. Another voter tweeted a similar complaint about the same precinct, saying "I wouldn't show them ID and they held me at the gate and blamed me for holding the line. Precinct A014." During the primary elections in August, two similar complaints were made to the office of Broward County Supervisor of Elections Brenda Snipes. "Access to the polling station was hindered as it was moved to a gated community -- security checking ID," reads one complaint. A second read: "Did not like the new voting site - Century Village -- gated." The complaints were obtained by WLRN through a public records request sent in September. Complaints made during the August primaries regarding Broward County precinct A014, in Deerfield Beach, which was moved from a local community center to a building inside a gated community earlier this year. Patricia Santiago, an assistant to Supervisor of Elections Snipes, said the office "wasn't aware of those complaints" made about access to the polling location during the primaries. She said the office is "trying to talk to the facility to see if they will accept" not demanding IDs to enter the premises on election day. Yet she said so far the community has "declined" to let people pass through without showing IDs "because of the safety of the residents." Other sites across the state are seeing issues with access due to polling locations located inside gated communities with private security. Complaints have come from Orange County, where a voter said private security was not allowing anyone to enter Stoneybrook East Fitness Center, an official polling site, if they do not hand their ID to private security guards. The situation was handled by the Orange County Supervisor of Elections Office around 10am on election day, according to general counsel Nick Shannin, who says he communicated directly with building officials. "It's a traditional kind of issue because when you have so many voting sites, you can't possibly have them all at government buildings," says Shannin. "You have to use some private facilities and private facilities have rules. But they can't be rules that conflict with the rights of voters to have access." Likewise, in Pasco County, a voter complained that visitors were made to state their reason for visiting the Groves Community Development District before they were granted access. 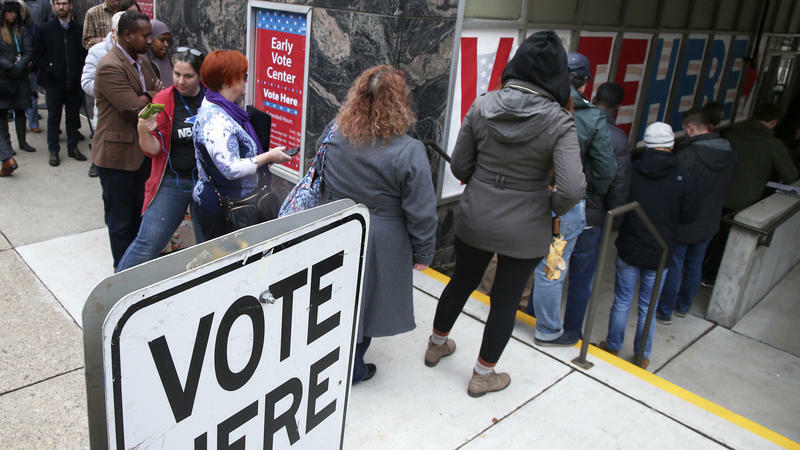 The complaint alleges a woman with a thick Spanish accent was initially turned away when she stated she was there for voting -- the security apparently mistook it for "boating." She was later allowed to enter. The Pasco County Supervisor of Elections Office told WLRN the issue was settled early in the day, and the gate has been opened wide. A reporter for the Palm Beach Post similarly tweeted that she was being denied access to a polling site located inside a gated community in Boca Raton, due to private security guards. In Deerfield Beach, Polizzi described a situation that could have broad implications. "You don't even need an ID to cast a provisional ballot, so it seems like some kind of voter suppression to me," Polizzi says. She is correct: Florida Law does not require ID for voters to casting provisional ballots. The fact that it was a third-party private company that was collecting her information was troubling, Polizzi says: "Like: Who are they? And what are they doing with my information?" Ultimately, after arguing with staffers and supervisors, Polizzi says she was allowed to enter the voting site without having to hand over her ID. As she left, she says she saw cars backed up at the security gate and voters handing their IDs to private security. This story was reported with a tip from ProPublica’s Electionland project, which monitors voting problems around the country. Tell us if you’ve had a problem voting here. Live Election Coverage: Trump or No, South Floridians See Contest of "Good Vs. Evil"